Launched in the summer of 2016, Fueling U.S. 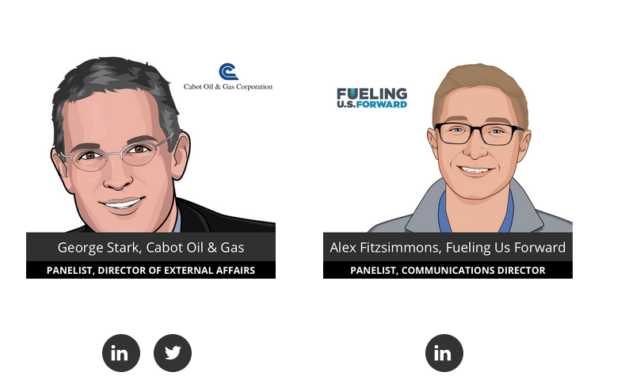 Forward was a public relations campaign dedicated to bolstering public opinion of fossil fuels through positive messaging about the alleged necessity and affordability of coal, oil, and gas. The campaign eventually pivoted—as predicted—to attacks on clean energy and electric vehicles (EVs), before eventually going dark in October 2017. During his August presentation, Drevna also tipped his hand about one of the key strategies of the campaign, which we have since seen play out in a number of ways. “We’re partnering with other organizations too, especially non-traditional allies like the minority community,” Drevna told the crowd. 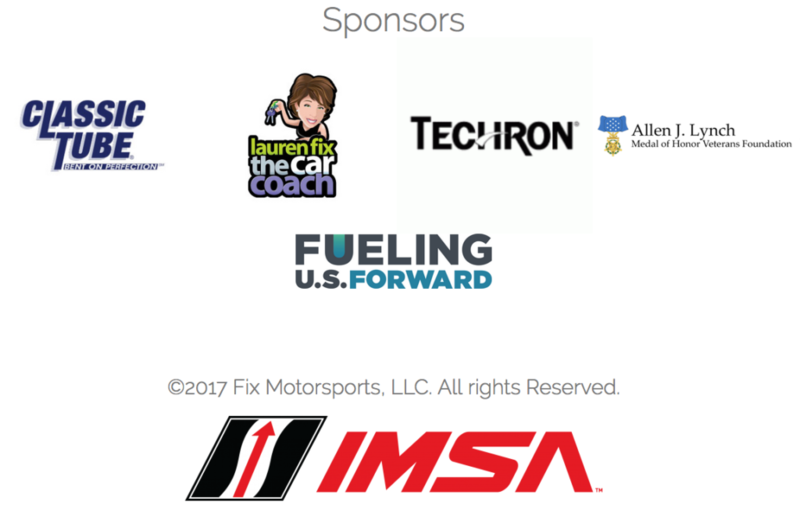 The group’s various sponsorships provide an interesting look at the targets of Fueling U.S. Forward’s PR efforts. Though the group’s budget is not public, according to an investigative report by Peter Stone published in 2016, the Koch brothers intended on spending up to $10 million annually in an effort to boost petroleum-based transportation fuels—the plan that seemingly evolved into the Fueling U.S. Forward campaign. 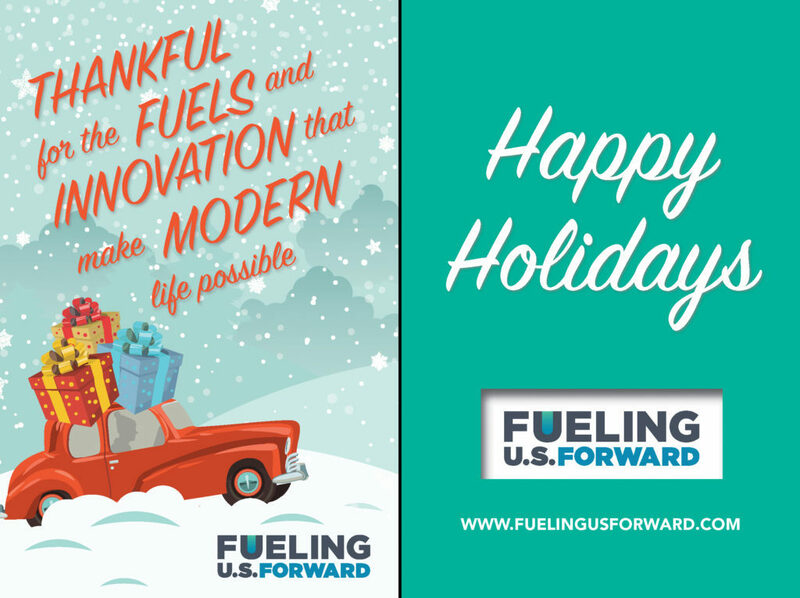 The FUSF messaging pivoted between pro-fossil fuel cheerleading to attacks on electric vehicles and clean energy solutions. A model for many of the EV attacks that would follow was telegraphed in an advertorial paid for by Koch Industries in April of 2016. The ad copy published in The Hill proclaimed that Koch Industries was “all for electric vehicles,” while simultaneously bashing the EV tax credit and ignoring all of the many subsidies that oil and gas producers benefit from. 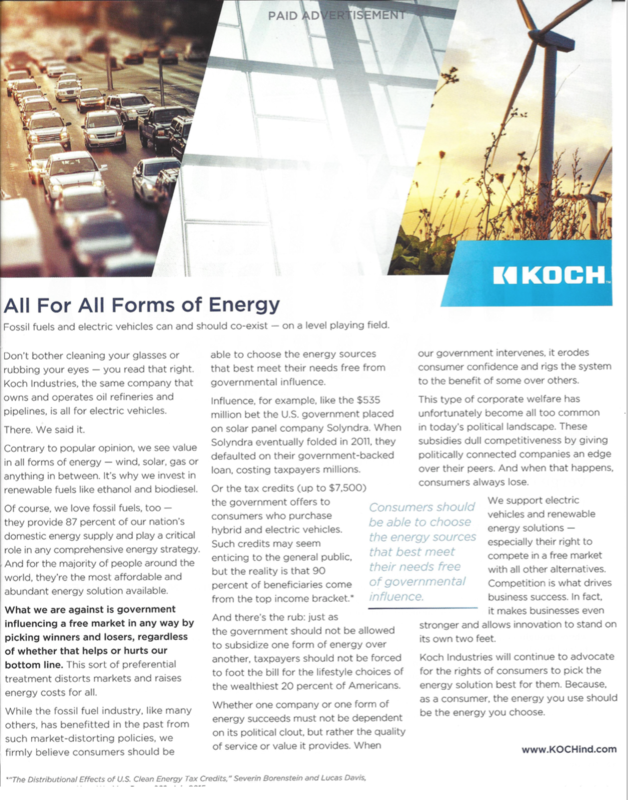 Koch Industries advertorial in The Hill, published in advance of the launch of Fueling U.S. Forward. Stone’s article outlined how James Mahoney, “a confidante of the brothers and member of their company’s board,” had teamed up with Charles Drevna, currently a senior fellow at the Institute for Energy Research, to develop and coordinate the campaign with oil and natural gas industry leaders. 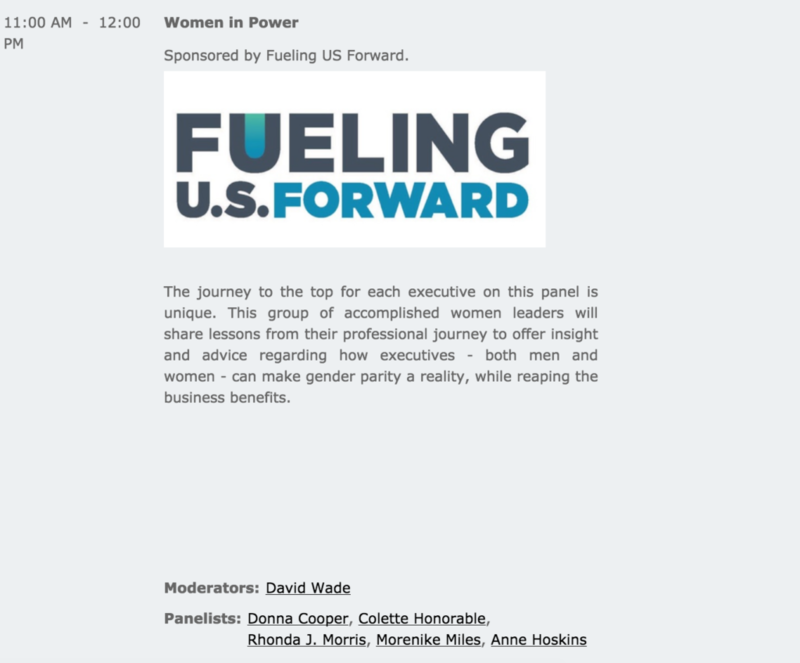 As it happens, Drevna spoke as CEO and President of Fueling U.S. 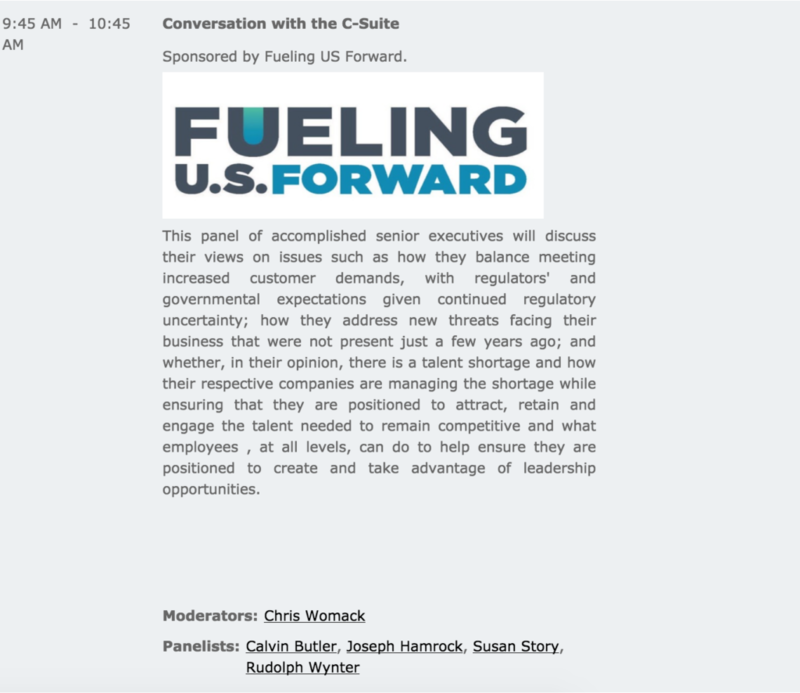 Forward at the RedState Gathering in Denver, Colorado, and will again at the Energy Expectations Conference hosted by U.S. Energy in October in Minneapolis, Minnesota. Hamilton Place Strategies is run by Tony Fratto, former deputy press secretary in the George W. Bush White House and Bush-Cheney campaign communications specialist. Partners in the firm are all predominantly GOP establishment veterans, many of whom have spent time on the Bush-Cheney 2004 campaign and the McCain-Palin 2008 campaign. Here is a roundup of the events or entities that we know Fueling U.S. Forward sponsored over its lifetime, as well as other notable actions and efforts. 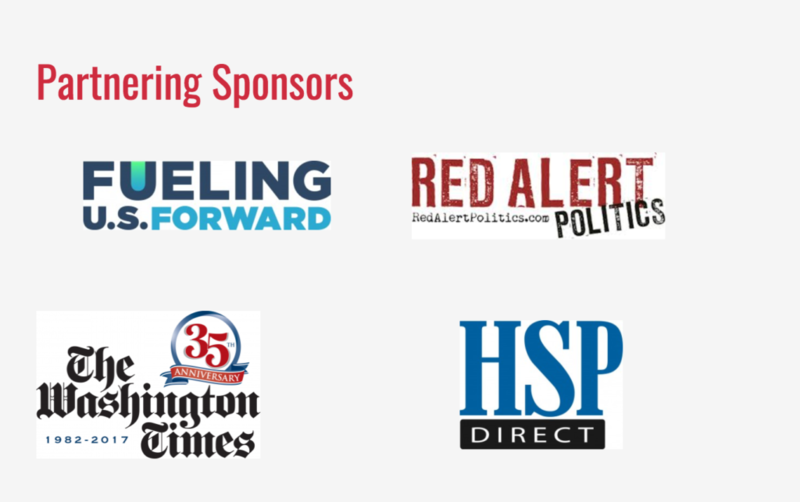 FUSF was listed as an “Additional Sponsor” of the annual conservative conference, where Charles Drevna publicly unveiled the campaign and confirmed to DeSmog reporter Sharon Kelly that Koch Industries was funding the project. The group also falsely claimed that they had partnered with the City of Richmond on the event, a claim disputed by city officials. FUSF representative Hubbel Relat presented $1,500 scholarships to three local high school students at a summit hosted by the Roanoke Valley Southern Christian Leadership Conference. The $1,500 scholarships were intended for an electrical lineman training program. FUSF was a “Partnering Sponsor” of the American Conservative Union’s CPAC 2017 Conference, which featured President Donald Trump, Vice President Mike Pence, Trump advisor Steve Bannon, and many other prominent conservative politicians. Alex Fitzsimmons, the Communications Director of FUSF, also spoke on a panel. 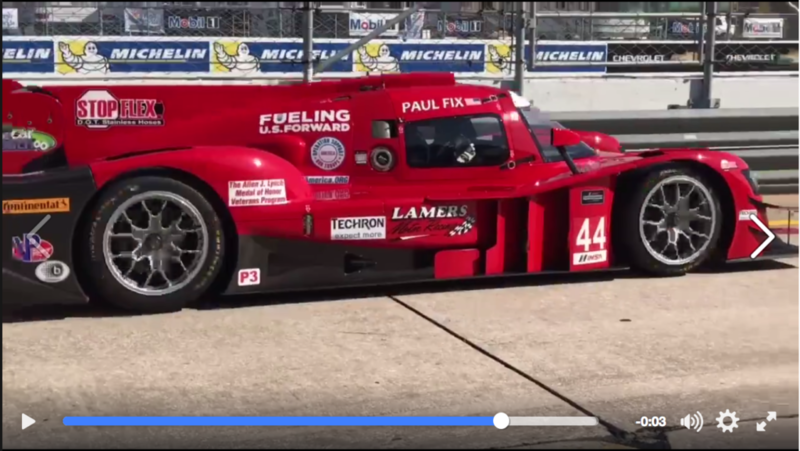 FUSF announces sponsorship of IMSA racecar driver Paul Fix. This seemingly random sponsorship would come into focus later when Fix’s wife, “The Car Coach,” hosted a Prager University video that bashed electric vehicles and accused the government of waging a “war on cars. Lauren Fix did not disclose the FUSF funding to her husband in her PragerU video, nor has ever mentioned it on the public record. FUSF released a pair of videos attacking electric cars for being both bad for the environment and subsidized playthings for the rich. 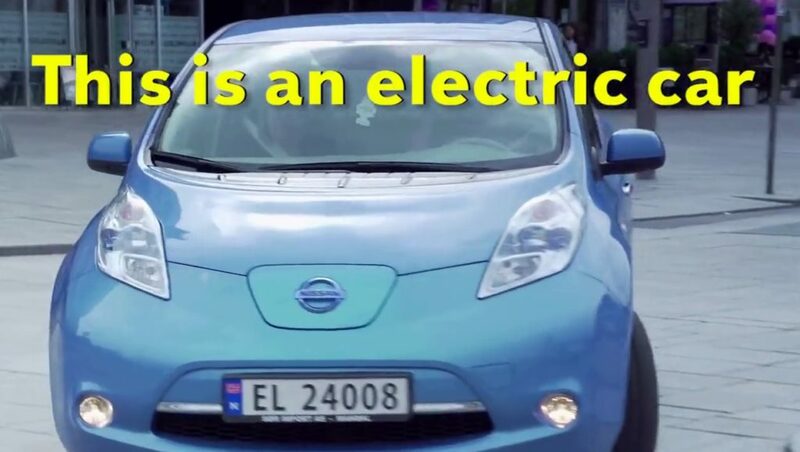 The first came in late June— a video attacking the “Dirty Secrets of Electric Cars,” signaling the start of their strategic pivot from straightforward fossil fuel cheerleading to electric vehicle (EV) and clean energy bashing. The video and accompanying Dirty Secrets of Electric Cars” page feature blatant factual errors, misleading statements, and glaring omissions (all of which were debunked thoroughly here), while essentially attacking electric cars for using the same materials that are needed to manufacture cell phones, laptops, defense equipment, gas-powered cars, and that are even a critical component of the very oil refining processes that form the foundation of the Koch fortunes. The second, “The Hidden Costs of Electric Cars,” criticized EV tax credits as a “massive wealth transfer from poor to rich.” This video was also extensively debunked here. With the two videos, the Fueling U.S. 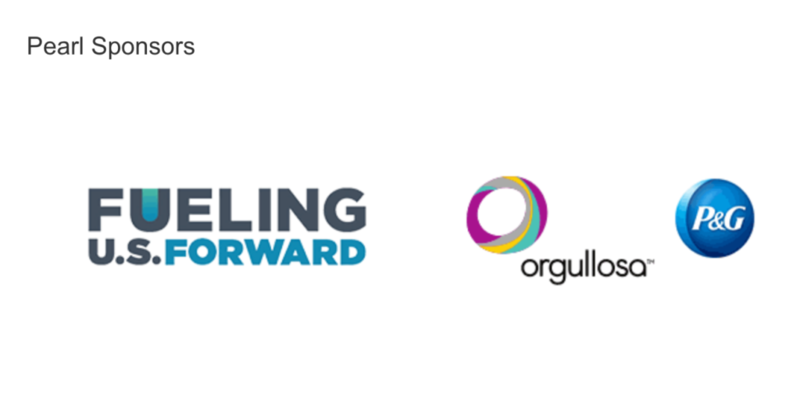 Forward campaign had completed a square pivoted from the oil and gas cheerleading that defined its first phase to deliberate attacks on electric vehicles and clean energy. That second attack phase didn’t last long. Within two months of the second video’s release, the campaign had gone totally dark and all evidence of Fueling U.S. Forward was deleted from their website and social media accounts.